Flexi-Coil has introduced new productivity and safety features on its air carts in time for 2012 seeding. The brand new FlexControl IV+ onboard computer allows growers to monitor and control Flexi-Coil air seeders, compatible tractors and combines, guidance systems and other ISO11783-compliant implements, right from the vehicle’s cab. In addition, Flexi-Coil is the first agricultural machinery supplier to provide upgraded ladders and railings to meet AS1657 (Australian Standard). These will be standard on Flexi-Coil 40 and 50 series air carts. 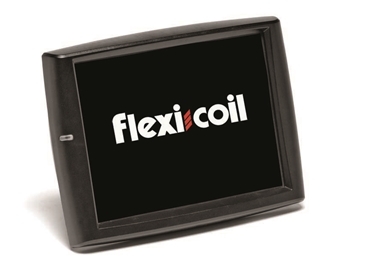 The FlexControl IV+ is a 10.4-inch, colour display that replaces the previous FlexControl III display. The touch screen allows you to control the vehicle or implement. It displays essential information such as ground speed, fuel usage (on compatible tractors) and seeding rates and allows you to make adjustments on the go to maximise efficiency. The display’s overall layout has not changed, so users familiar with the previous model will experience a virtually seamless transition to the FlexControl IV+. Some of the FlexControl IV+’s new features include: USB connection ports so users can store information on a USB device; video connection points to allow video input; and an Ethernet port for future web-browsing capability. Other ports and connectors on the new display remain unchanged from the previous version. The FlexControl IV+ can be used to control various Flexi-Coil air cart functions such as fan speed monitoring, air velocity tracking, tank level tracking, on the go seeding rate adjustment, diagnostics, ground speed, acre/hectare counting and estimated time remaining for tank level. With additional software the FCIV+ can provide coverage area mapping, summary data, single section Automatic Overlap Control, As-Applied mapping of up to seven different products, prescription controlled product application and container level tracking. The FlexControl IV+ is standard on all Flexi-Coil air carts manufactured from October 2011. Customers who have a Case IH AFS Pro 700 or New Holland Intelli-view IV display may choose to delete the FlexControl IV+ from their order.